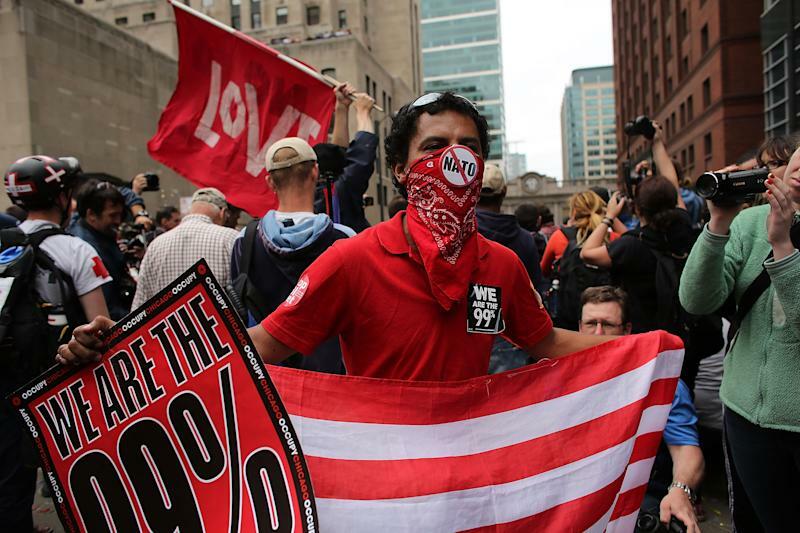 CHICAGO (AP) — Protesters gathering in Chicago for the NATO summit were gearing up for their largest demonstration Sunday, when thousands are expected to march from a downtown park to the lakeside convention center where President Barack Obama and dozens of other world leaders will meet. Hours before the main demonstration was set to start, protesters were already gathering at Grant Park holding signs including one that read: "NATO, Go Home." One protester walked with an American flag turned upside down. A day earlier, several hundred demonstrators wound through the city's streets for hours, testing police who used bicycles to barricade off streets and horseback officers to coax them in different directions. Increasingly tense clashes Saturday night between protesters and police resulted in 18 arrests, Police Supt. Garry McCarthy said. Most of Saturday's demonstrations remained relatively small and peaceful, including one march to the home of Mayor Rahm Emanuel, Obama's former chief of staff. But a later march stretched for hours as protesters zigzagged back and forth through downtown, some decrying terrorism-related charges leveled against three young men earlier in the day. 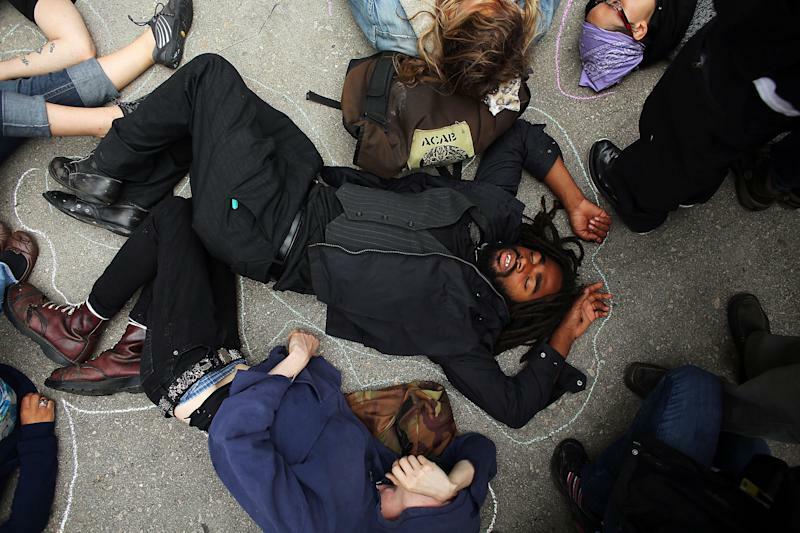 Organizers pledged a larger crowd when protesters from the Occupy movement will join forces with an anti-war coalition to mark the opening day of the summit later Sunday. 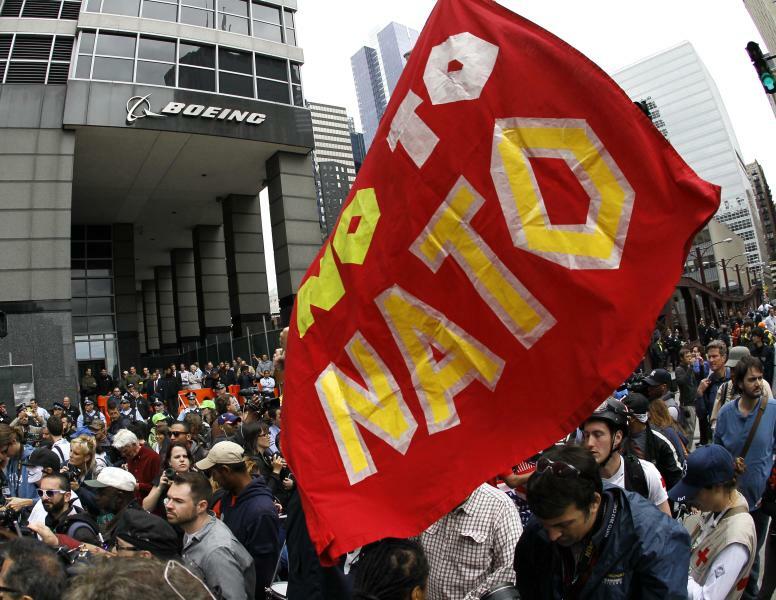 "We want the world to focus on NATO — they're not important and have no mandate anymore," said Micah Philbrook, an Occupy Chicago spokesman, who criticized the large police presence Saturday. "They're pushing us around and not letting anyone get out of the protest even if they want. They're very aggressive." McCarthy said police would be ready with quick but targeted arrests of any demonstrators who turn violent Sunday. "If anything else happens, the plan is to go in and get the people who create the violent acts, take them out of the crowd and arrest them," warned McCarthy, at the scene of protests after dark. "We're not going to charge the crowd wholesale — that's the bottom line." He said officers had been hit by batteries and bottles thrown by protesters during the day. "You can't control what other people are going to do, but I can tell you our cops are doing a great job, and they're prepared," he said. Police said Sunday they were investigating a confrontation that happened Saturday night when a police van ended up surrounded by the protesters who were marching downtown. Protesters say the van accelerated through the crowd, injuring a protester who was caught in front of it. The protester was taken away by ambulance. But police spokeswoman Melissa Stratton said it appeared the driver of the van was punched through the window and one of the van's tires was slashed. She said the incident remains under investigation, and she was not sure whether the protester remains hospitalized. Security has been tight throughout the city, as the heads of state from about 60 countries began arriving to discuss the war in Afghanistan, European missile defense and other issues. As police gathered en masse on street corners, near parks and key landmarks, the city's streets remained largely vacant and many downtown buildings closed. "It's strange because downtown is empty," said Gabe Labovitz, a 44-year-old economist out for a walk near his home. "The police presence is reassuring but unnerving." Three activists who traveled to Chicago for the summit were accused Saturday of manufacturing Molotov cocktails in a plot to attack Obama's campaign headquarters, Emanuel's home and other targets. But defense lawyers argued that the police had trumped up the charges to frighten peaceful protesters away. They told a judge it was undercover officers who brought the firebombs to an apartment in Chicago's South Side where the men were arrested. On Sunday, police said a Chicago man also was in custody after being accused of planning to make a Molotov cocktail to be used during the NATO summit. Sebastian Senakiewicz, 24, was charged with one felony count of terrorism/making a false threat. He was scheduled to appear in court later Sunday. Police said Senakiewicz was working with others to produce explosives to be used during the NATO summit. A call to the National Lawyers Guild was not immediately returned, and it was unclear if his arrest was related to the other three men. Associated Press writers Michael Tarm, Ryan J. Foley, Sophia Tareen and Nomaan Merchant also contributed to this report.